The low pressure SLP-35 sensor from Pewatron can be configured in a number of ways according to customer specification. 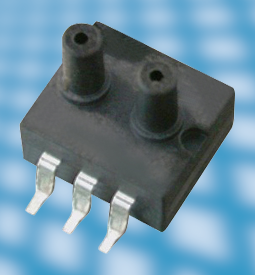 The basic sensor is a small SMD 6-pin dual-port sensor with a 14 x 10 mm total footprint. The sensor output can be digital, analog amplified or analog unamplified. The minimum pressure is 1 kPa differential or gage. The maximum differential pressure is limited to 50 kPa. The SLP-35 sensor have little sensitivity to humidity and direction, and have an excellent zero stability. This makes the sensors an optimum choice for applications such as HVAC, process control and medical devices where high quality and attractive pricing are important. All models are available with voltages between 2.7 and 5.5 VDC. Accuracy is < 1.8% in a temperature span of 50°C, and the standard sensors can be operated up to 85°C. PEWATRON specialises in physical and geometrical sensors, power supplies and e-components. PEWATRON supplies a wide selection of electronic components ranging from standard products and modified standard products to customised solutions. PEWATRON works closely with developers, with the option of involvement right from the start of a product's development process to ensure, together with the customer, that the best component is found for the application. PEWATRON, an independent company belonging to the Angst+Pfister Group, has been providing customers in Europe with prompt and individual service for over 30 years. Through the Angst+Pfister Group, PEWATRON is part of a worldwide network comprising over 1,000 employees and 60,000 satisfied customers.